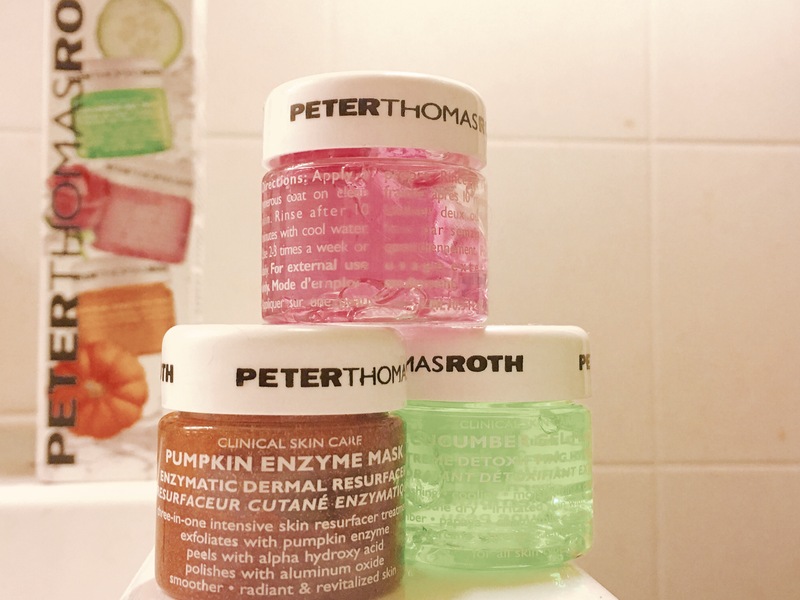 I’ve been playing around with a pack of three of the most famous Peter Thomas Roth Face Masks I discovered at Sephora — 3 beautiful and deliciously scented travel-sized pots with enough product for quite a few applications. so there’s pumpkin, rose and cucumber. Pumpkin Enzyme Mask — this is basically a two-in-one exfoliating mask with both chemical and physical exfoliants in it. this kind of masks is amazing to help your skin regenerate in a more even way. it smells like there’s something sweet in the oven in a fall evening made out of pumpkin and cinnamon, and its texture is slightly gritty and a bit more dense than the other two. you should gently rub it on the skin to start the exfoliation process and then let it sit between 3 to 7 minutes. it gives a strong tingling sensation, but I didn’t feel that it was too overwhelming (if it burns, please rinse it off immediately), and I used my damp fingers to further use the gritty bits to help my dead skin cells loosen up and find their way out of my face while rinsing. it is a quite sturdy all-round exfoliating mask. my skin was left super supple, smooth and soft, and not at all dry. this is that kind of mask one should have on their stash and pull out every week or so (depending on your sensitivity and how much you exfoliate with other methods), that really helps lightening hyper-pigmentation and to even out the texture of the skin. this kind of masks (and exfoliators in general) are great to prep your skin to receive any kind of treatment or mask that delivers juicy nutrients. Rose Stem Cell Bio-Repair Gel Mask — is a deliciously scented gel that takes me to my parents’ rose garden on a crisp morning. although the stem cell technology is a little too hyped and not well explained by those who decide to use it, this mask does leave my skin feeling really nourished, soft and plumped after the 10 minutes it is supposed to linger on the skin. I love to use it in tandem with the pumpkin mask. Cucumber Gel Mask — is freshly scented and feel kind of uplifting on the skin. it is the less high-claiming mask, but it caters to one of the most basic needs of our skin. it is said to calm, soothe and deeply hydrate the skin, and it was a pleasure to use it after my recent flights. my skin felt really hydrated but not at all oily or heavy, and any slight irritations from the a/c on the airplane subsided quickly. it’s like a breath of fresh air. I would say this is a great choice for those with very oily skin, but also one of those masks you would naturally gravitate towards whenever you’d feel like a simple non-fuss pampering session. all in all, these masks are all very efficient and actually deliver what they claim. they are fuss-free, simple to apply and rinse off, take 10 or less minutes of your time, and give you that rewarding feeling of showing some immediate results. I know they cost an arm and a leg and a kidney in poor people’s money (around 50€ per full-size pot), but one must think that a face mask is something one would use once a week at most, so it will last quite a long time. the pack of 3, if you can get it, is absolutely amazing to try all the products out — and they give you a fair amount of product. there’s a 5 pack on Beauty Bay right now, and the full sizes seem to be a bit more affordable there, although I can only find the pumpkin one on Cult Beauty.